When you are just starting out with a dollhouse, it is hard to buy or make everything you need right away.A good solution for very inexpensive and easy to make window curtains is to create them from paper. They are very easy to make, and look quite effective in a dollhouse. 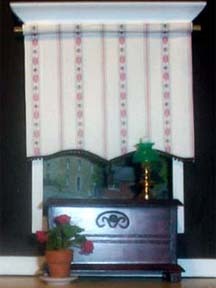 The paper used for the doll house curtains on this page is ordinary computer paper. 1. Cut the bamboo skewers [or any narrow rod] a little bit wider than the window, sand the rough end and then paint or stain them whatever you wish. These are the curtain rods. 2. 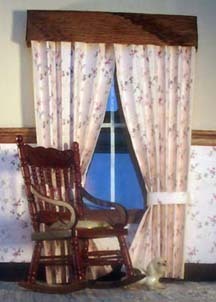 A rule of thumb for real curtains is to make each panel the width of the window. This has worked out well for me in real size; but I found that the paper cutains needed to be a bit more fullness. Making each curtain one and a half times the width of the window looked much better. 3. Cut you paper to the length of the windows.There is no need to turn up a hem at the bottom. 4. Now fold the paper curtain into pleats. Just like when you made paper fans when you were a child. It is tricky to keep the folds even, I have made a grid which you can use to help with this. To use the grid, first download and print. Turn over the paper with the grid printed on it and put it back in the printer, blank side up. Now print the pattern. The grid will be on the back of the curtains, it is very pale so it shouldn't show after the curtains are folded. 5. Once you have both curtains pleated it is time to glue them onto the rod. I am heavy handed with the glue for this job. 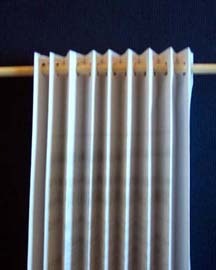 Apply a good amount of glue to the rod and simply lay the top of the curtains onto the glued rod. If the curtain won't stay down on the rod, lay a popsicle stick or whatever onto the curtain top then tape that down with masking tape to your work table to hold it in place. Prop the bottom end of the curtains up on another curtain rod so that the curtains won't dry on an angle, we want them to hang really straight. 6. Go do something else. The glue needs a couple of hours to dry thoroughly. Here we have a chintz look for the curtains and wallpaper. The pelmet is made of a scrap of balsa wood which I stained. These curtains look quite formal with the matching pelmet. Adding a little bit of trim makes the pelmet look classy. You may want a pelmet or window topper. You don't have to have a topper but it can give the curtains a more finished appearance. 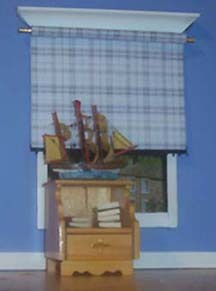 1.If you want the pelmet to match the curtain you need to print one copy of the pattern onto card stock. Always spray your printables after you print them so that the ink won't run when you use glue on them. 2. Cut out the pelmet from the card stock the size you need, just a bit wider than the window plus about an extra half inch on each end. 3. Fold each end in about half an inch. Add a tiny block of wood or a square bead to the top ends. This is so that you can glue it onto the dollhouse wall. See illustration below. 4. Reinforce the back side of the pelmet with thin wood, popsicle sticks work well. See illustration below. 6. Go do something else. The glue needs a couple of hours to dry. The curtains below have a window topper or valance. The cafe curtains were made by making as small a pleat as I could manage. If you want a fabric topper you can just use lace. This valance is made from a piece of lace with a piece of decorative braid glued onto it. I tied the curtains with a piece of embroidery thread before I added the braid tie backs. 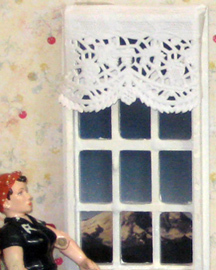 There are various ways to hang the curtains in your dollhouse.You might be able to hammer a couple of pins into the top window frame, then sit the rod on the pins. A lot depends on what the window frame is made of. Museum wax or tacky wax might do the trick, but that can get too soft if you live in a hot climate. A regular all purpose glue would work well if your doll's house is not full and you could turn it on it's side while the glue dries. I just use a glue gun for most of mine. Should you change your mind, it is relatively easy to remove glue gun glue if you heat it a bit with a hair dryer and scrape off with a knife. Two heads are always better than one, this idea comes from Carole. I sent her this web page while I was still making it. 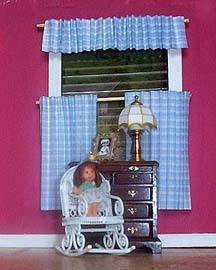 As soon as she saw the paper curtains, Carole came up with this idea for no-sew and no-glue doll house curtains. Simply use a hole punch to make holes at the top of your curtain and thread it onto a mini curtain rod. It occured to me that this would be a good project for children. No muss no fuss. 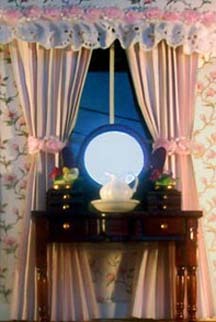 Here is another good idea for a dollhouse window curtain, you can use paper doilies or fancy shelf paper. This one is in a Rosie the Riveter room box, created by Shar in Washington U.S. Who would have thought that Rosie would choose such lacy curtain? She is showing her feminine side. I goofed when I made the blind above, you can see that the plaid on the roller[ bamboo skewer ] and the plaid on the 'pulled down' blind don't line up. I wasn't going to post it here, but you might as well learn from my mistake so here is where I went wrong. I wanted to do a good job and thought I had it all worked out. I reasoned that the plaid pattern would have to be on both sides because when I rolled it onto the rod the back would show, I bonded one paper to the other with Heat'n Bond, but I didn't think about lining up the pattern. Duh! Yet another learning experience. A lot of the fun of having doll houses as a hobby is that our ingenuity is constantly being challenged. I decided to have another go at making a blind. This time I used just one layer of paper. I rolled some onto the 'roller' and made the 'pulled down' part of the blind seperately. I glued them together being careful to line up the stripes this time. This worked out much better, a fancy shape and some trim at the bottom of the blind and you can almost forget it's just made from paper.